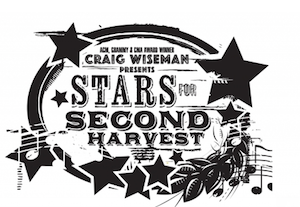 O’Charley’s and Second Harvest Food Bank of Middle Tennessee will celebrate the 11th annual Stars For Second Harvest hosted by Craig Wiseman on Tuesday, June 9, 2015 at 7:30 p.m. at Nashville’s historic Ryman Auditorium. The evening brings songwriters and artists together for a slate of acoustic-style performances, and has previously featured artists including Florida Georgia Line, Jake Owen, Keith Urban, Dierks Bentley, Vince Gill, Luke Bryan and more. Nashville-based O’Charley’s is the benefit show’s presenting sponsor for the 11th consecutive year. Proceeds from the concert benefit Second Harvest Food Bank of Middle Tennessee in their efforts to feed hungry people and work to solve hunger issues in our community.